Getting new grass to grow can't be that difficult, can it? Why do so many people encounter a struggle? Is there a secret you should know? You planted grass seed recently, yet your “brand new” lawn area looks like it needs renovation. You’re planning and preparing to put in a lawn, and want to know what will produce the best results. The next thing on your “to do” list is throwing down some grass seed, and you have no clue what you need to do or what you're up against. There is no mystery why the grass is greener on the other side of the fence. The neighbor knew the right things to do when he was getting new grass to grow. He knew the right time to do them, and he knew what not to do. In just a few minutes, you can have that same information! The fundamental areas in which anyone might have trouble getting new grass to grow cover a broad spectrum. Typical difficulties that arise deal with soil, fertilizer, water, location, seed, weather and maintenance. Each of these topics alone can cause poor results when you try to grow grass. A situation may be fairly simple to identify, but somewhat difficult, even impossible to correct. Other times it is a combination of negative influences that can produce an inferior lawn, but the solution is relatively easy, once you understand the problem. Let’s look at each of these factors in order, and consider what approach can prevent or correct a problem, or at least minimize the impact. Getting new grass to grow successfully is directly proportional to both the quality of the soil, and soil preparation prior to planting grass seed. The best soil is loose, with abundant organic matter in it, and has a texture that holds moisture well, yet drains easily. If the lawn is not yet planted, add amendments and/or new soil to provide the best growing medium. This is probably the most important step you can invest in for getting new grass to grow well at the beginning as well as long term. A major reason for soil preparation is to give the grass seedlings an easier start. All ground areas get compacted over time. It is difficult for the roots of grass seedlings to penetrate hard soil. Not only is there the physical barrier, but sufficient moisture and oxygen are in short supply when the soil is compacted. The best solution for compacted soil in an existing lawn is aeration. More will come on that in a later article. At the pre-planting stage, rent a rototiller to loosen up the soil in large areas. If you're just reseeding patches here and there, use any tool you have to work the soil, as deep as you can. Digging with a shovel is great, although you may have to remove a small amount of soil if the loosened area sits higher than the surrounding area after raking it level. Or use a cultivating tool or rake, after you have moistened the soil to make it soft. If you already put down seed, without any soil preparation, getting the new grass to grow well is going to be difficult. Work at improving the health of the soil as an ongoing project. Organic lawn fertilizers can be used to build soil fertility in addition to providing excellent nutrients to help the grass. Be aware that these natural fertilizers can take longer to show results when the soil temperature is cooler. Read another article to learn more about organic fertilizers. Organic top-dressing amendments also help to build soil fertility. It would be difficult to use them on a newly seeded lawn if the grass has already sprouted. You don't want to bury the grass, and you don't want to take a chance on uprooting the seedlings by raking the amendment around. So reserve this treatment for a lawn that was seeded at least 2-3 months prior, when it just sits there and you haven't been successful getting this new grass to grow past an inch or two. You can apply gypsum to improve the texture and drainage capability of the soil. Powdered gypsum can be applied at a rate of 10 pounds per 100 sq. ft. Pelletized gypsum should be used at the rate recommended on the bag label. Soil fertility can also be built up by the use of a mulching mower that recycles clippings to the soil in very small pieces, instead of bagging them. Actual preparation of the soil for a new lawn, step-by-step, will be covered in a separate article. Many sources will tell you to automatically add fertilizer when you plant a new lawn. Take caution with this approach. Fertilizer is not always needed at the initial stages of getting new grass to grow. When it is required, the wrong type of fertilizer can do more harm than good. Good soil, especially if new organic material has been added during preparation, probably has sufficient nutrients to feed new grass. When the lawn is completely filled in, after the second or third mowing, a good slow release fertilizer is recommended to help the lawn mature. If the soil quality is not so good, or the grass is already up but not thriving, then add only a starter type fertilizer. This type is lower in nitrogen, higher in phosphorous and potassium. An example would be 6-20-20. (Learn about NPK Fertilizer Numbers). A starter fertilizer stimulates root growth and sturdy blades rather than fast, lush growth that will stress a new lawn with an immature root system. Avoid high nitrogen fertilizer, the typical lawn food. This might sound like the best thing for getting new grass to grow, but it will actually do a better job giving all the weeds a head start to compete with your lawn. After three months, if the grass has matured well, but needs a boost, switch to a regular lawn fertilizer. There are many options with lawn fertilizer, and many opportunities to use the wrong kind or waste your money. Be sure you understand the fundamentals of fertilizers, what they do, and how to select the most appropriate type. Read this article to learn more about fertilizers. Seventy percent of them have a problem with water. Seventy percent of these gardeners refuse to believe they could have a problem with water. The significance of that? It means that half of the people who are struggling with the condition of their lawn are unwilling to look at the most likely source of the problem. Obviously, a discussion of this topic is made difficult by the wide variety of conditions that occur in one geographic area compared to another. One gardener may rely on rainfall for most of his lawn's needs. Another may have to use irrigation water exclusively. Wherever you may be, at least realize the importance of proper watering during the critical stages of a young lawn. Don't ignore the need to be diligent about this. Insufficient water during germination can let the seed die before it comes up. Over-watering can also kill the seed. Getting new grass to grow to the point where it comes up out of the ground can almost seem to cause as much worry as a new baby. Get the details on watering new grass seed. Inadequate watering of young grass seedlings will stunt or kill them. Irrigation systems are notorious for irregular coverage due to poor design or needed maintenance. If you see a problem area in a young lawn, dig up a shovelful of soil and grass from a good patch and a sick patch. Compare the soil moisture levels to see the most typical problem. Return the chunks of sod to their holes and get the hose out. Another type of water problem is incorrect watering practices. Once the lawn is fully up, the watering frequency should be reduced to once daily. The amount of time should be lengthened to encourage deep soil moisture and deep roots. The watering intervals (time between waterings) should be extended as the grass matures, weather permitting. Getting new grass to grow deep roots can be accoumplished by training the grass to go several days between irrigation cycles. Use your best judgment in making these adjustments, and do it in stages. Don't make significant changes during the hottest season when the grass is not deeply rooted. The fall season is an excellent time to start weaning the grass away from daily watering. Weather permitting, go to watering every other day, instead of daily. Lengthen the watering time slightly, to force the water deeper, if you can do this without getting run-off. After about 4-6 weeks, expand the interval to water every third day if weather conditions cooperate. Again, lengthen the watering time, to soak deep. If you have a problem with water run-off, do this: apply half the amount of water, wait an hour (do a few other zones), then water again the second half amount. This will promote deep soaking and is better than watering smaller amounts every day. Grow More E-Z Wet Soil Penetrant from DoMyOwnPestControl.com and SoilLogic's Liquid "Gypsum"
Continuing to water a lawn frequently and for just a few minutes encourages the grass roots to remain at the surface. When heat or wind or other stress shows up, the grass cannot handle it. 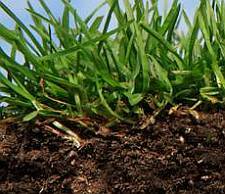 Getting new grass to grow successfully and permanently means getting deep roots to grow. A lawn is sometimes designed for an area after important consideration of the best setting and conditions. (Rarely!) Usually it happens to be the only place it can be. Unfortunately, some areas are not conducive to successfully getting new grass to grow. Adjacent structures and trees may block and prevent a sufficient amount of sunshine necessary for grass to grow well. If you are in the planning stages, select a variety of grass that does better in a shady location. This is a compromise, since grass, by its nature, needs sun, and a shaded spot is never ideal. If your lawn is not able to get at least 6 hours of sun each day, it will not thrive. This will probably result in the need to reseed thin areas every couple of years. Trees compete with a lawn for sunlight, water and nutrients. First is the shade factor. Existing trees may be candidates for pruning to let more light through. This could include thinning out some of the interior branches and/or removing lower branches. Not all tree styles and structures are appropriate to these methods. Do not attempt to do this without being familiar with proper pruning methods in general as well as for your specific variety of tree. Side-note: Do not hire a tree trimming service... IF their intention is to "top the tree". The dense new growth that results will become a worse shade problem once it starts to spread out. Only hire reputable, and recommended, tree trimmers. Be sure you know what they will do, or not do, before you contract with them. If you have a tree with exposed roots, this may be the normal growth style of that tree, or it may be the result of watering practices. The cycle and duration of irrigation for a lawn is not adequate or appropriate for trees. It causes extensive surface roots that soak up a lot of water. However, it is usually not possible to remove them without destabilizing or killing the tree. It is difficult for grass (and many other landscape plants) to compete with tree roots. Getting new grass to grow may not be so difficult, as it will be getting extra watering cycles. Keeping it growing and thriving long term is another matter. A normal supply of water may not be enough for a tree and a lawn. Are you in a position to provide extra water on a regular, long term basis if a shallow rooted tree is present? Are you planting a tree in or near the lawn area? Develop a means of providing infrequent, but deep, soaking irrigation to trees, separate from the lawn irrigation. Encourage the roots to grow deep to follow the water, rather than spreading out into the lawn. Check the specifics on the tree growth pattern before making a selection. Trees can dominate a landscape, and be a thing of beauty. When a tree dominates a lawn, it can cause trouble. If having a beautiful lawn is most important to you, but you have a tree that looks like it will make that impossible, consider removing it. Or replace it with one that has a more upright, narrow form or an open canopy, plus deep roots. If your ideal landscape picture includes a beautiful, wide-spreading tree, or one with a low branch structure, consider alternatives to placing a lawn right underneath it. This would avoid a major source of difficulty with getting new grass to grow. Does the lawn location get heavy traffic or support constant activity? These conditions require a sturdy variety of grass. During the germination and early growth period all activity must be restricted from this location. This means the area should be completely off-limits for the first 6 to 8 weeks after seeding. Limited activity after that is best until the grass matures. Realize that the ground is quite susceptible to compacting with all the extra watering a new lawn receives. So try to avoid traffic on new planting areas. Be realistic in your expectations for grass in traffic areas. Picture the wear patterns that happen in a lawn on many college campuses, as students hurry from one class to another. Smart landscape architects will now wait and observe student initiated travel routes before designing a lawn area. Then they put sidewalks or other paths where the students have claimed right of passage. Consider how your normal usage will impact your lawn project, during the growth stage and long term. Can you redirect traffic temporarily? Can you incorporate some type of path that adds value by being attractive itself in addition to taking some of the wear and tear off the grass? Many landscapes are enhanced with a well designed path made of an appropriate material. A lawn location with a significant slope can create serious problems. It will be difficult to water adequately during the time the seed germinates, without moving the seed out of position. Ongoing irrigation will be difficult without wasting water due to run-off. Consider using ground-cover plants on slopes, instead of grass, if possible. Alternately, investigate a few varieties of grass that are excellent plants to prevent erosion. Sheeps Fescue, Hard Fescue and Creeping Red Fescue in these situations are allowed to grow to their maximum length and drape over in a natural flowing manner. That's right, no need to mow or trim! Select the grass seed variety best suited to your area, to the conditions of your location, and to the functions it will support. Check the test date on the product to see how fresh is the seed. Check the germination percentage rate of your selection and apply a sufficient amount for thick coverage. Plant the seed when the soil temperatures are correct for that particular variety. To understand the specifics of these last three items, see the article Grass Seed Germination. 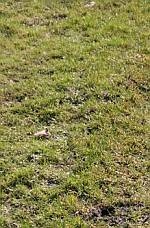 Grass seed needs to be in direct contact with the soil to germinate. It needs loose soil for the roots to penetrate. Cover seed with a thin layer of mulch to protect from birds and to retain moisture. Keep seed and soil constantly moist during the germination time, but not soggy. See Planting Grass Seed for these last three items. There is nothing we can do about the weather, right? Just try to avoid the extremes when you embark on getting new grass to grow. Exceptional heat, cold or wind can seriously hinder a young lawn. But the same conditions can kill new grass seed in the process of germinating. Adjust watering cycles according to what the weather is doing. Reduce other stresses if possible whenever the weather presents a challenge. Mowing, fertilizing, spraying chemicals and football games are all stressful to a lawn. Maybe negative comments should be avoided too! Get tips before you start your lawn project by reading The Best Time To Plant Grass Seed. Getting new grass to grow is more than just preparing, planting and watering correctly. The first two or three months after germination (the adolescent stage?) require special treatment in several ways. Wait on the initial mowing until the majority of the grass is 3 ½” high or more (for bladed grasses, not the creeping type). Raise the height of the lawnmower to take off no more than 1” on the first mowing. Never violate the last rule. Grass needs the surface area of the blade for photosynthesis. This produces food for the grass to grow. The first mowing must be done with a sharp lawnmower blade. A dull blade could tear the young grass plant out by the roots instead of cutting it. All mowing should use a sharp blade. A dull blade tears the grass or smashes it off, instead of cutting. This will show as brown tips in a few days. 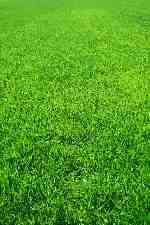 It causes stress and makes the grass susceptible to problems, possibly disease. Don’t spray chemicals on young lawns. 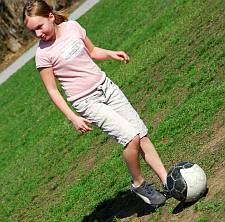 Weed killers and fungicides will harm young grass and might kill it. Wait until it is at least 4-5 months old, or longer depending on the strength of the chemical. Some people may just throw a bucket of grass seed out and hope for the best. Take your time if you expect results that will satisfy. The extra time and effort that you invest to do it right will reward you with fewer problems and expenses later. If the information in this article has you re-thinking whether or not to tackle a lawn project, take advantage of other articles in this series before you decide. Lawns are a big commitment. Alternatives to grass lawns are becoming quite popular. Investigate fully, prepare completely, do it right, then enjoy the result!